From PlayStation to XBOX; get your console set up with one of the best TV’s to enhance your gaming experience. Whatever type of gamer you are; whether it be RPGs, first person shooter or racing games, having a good quality TV makes all the difference to your entertainment experience. There might be something slightly nostalgic about you and four of your mates sitting around a tiny screen playing on your PlayStation after school, but the world of gaming technology has vastly improved in recent years, and now you can have a truly immersive experience with the likes of HDR and 4K televisions. 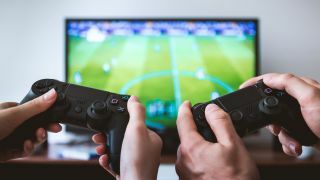 Of course, you could hook your games console up to your regular TV, but with a television specifically designed with gaming in mind, the pictures will be crisper, the sound will be louder, and you won’t have to worry about the game lagging or the screen freezing because it can’t handle what’s going on. 4K is obviously regarded as the best in terms of resolution and picture quality, and if you’re going to purchase a TV for gaming, then there really is no other way to go than with a 4K TV if you want the best of the best. You may also want to look out for a TV with HDR support, to really up the visuals! Other things to look out for include response time and refresh rate. TV’s are usually more limited than gaming monitors, but overall 4K TV’s tend to have a good response rate which will improve the quality of gameplay and make it less frustrating for you. In terms of size, bigger doesn’t always mean better, but if you want to use your TV for watching movies as well as gaming, then something between the 40-50 inch bracket will allow you to make the most of viewing and gaming. We’ve picked out some of the best TVs for gaming on the market right now. Most high quality TV’s will set you back over £1,000, but there are still some decent screens out there for under that amount, too. Check out our round up to see what suits you best! This QLED TV from Samsung is regarded as one of the best TVs for gaming on the market right now. It has everything you could need to make the most of gaming as well as watching your favourite movies and shows. What customers like particularly about this TV is how fast it is, so you expect effortless gameplay with no input lag. The screen is a whopping 65 inches, which for some will be great, but if you’re gaming in a smaller room, sometimes it can actually be a little too big. This TV has a super-slim design so it can be mounted on the wall with little to no space in between which makes it looks sleek and smart in any room of the home. If you’re all about visuals, then this Samsung TV could be the best choice for you. This TV supports HDR content which means you can expect the most stunning visuals during gameplay and also get clear and crisp images when watching movies or shows. If you want the next best thing to the Samsung Q9F QLED, then this is probably your best bet. However, users have said the sound quality could be better for what it is. Many have paired this TV with a sound bar though and say that really completes the package. The LG OLED E7 is a great option for those who want an all-round high-quality television. What this TV has that the Samsung may lack is excellent sound quality which comes from the integrated sound bar. Those who have this TV were very impressed with the sound and picture quality combined, which makes it perfect for all types of gamers. Not only that, but the operating system is regarded as fast and fluid, which means you won’t have any frustrating moments where the TV lags during gameplay, and navigating your way around the smart hub is also said to be a breeze. It’s got a large 65 inch screen which is a great size for the living room where all the family can enjoy this TV for a number of purposes. If you’re taking your first step in the world of TVs for gaming, then the Samsung MU7000 Series is a good place to start. This TV is excellent value for money as it offers 4K HDR picture quality so you can experience all of your games in the highest quality they were intended to be, and you can even stream games to this computer without a console, so you can experience all of your favourite retro classics in high definition, too. Customers were very impressed with both the sound and picture quality of this TV, but some did mention the speakers can rattle a little when the volume is up very high. Overall, for the price of this TV it makes for a great medium-sized television for both immersive gaming and movie watching. Those who are on a budget can expect some great features from this TV that comes in at under £1,000. Users were particularly impressed with the HDR quality of this television which makes it a great entry-level TV for gaming, as well as offering you all the features of a smart TV for keeping up to date with your favourite shows and having a cinema experience when watching movies. It’s a little tricky to set up, and not as slim as some of the rest, but the large screen is said to make it particularly good for multiplayer games and sound is best when teamed with a sound bar or external speakers. This is another great TV for gaming if you want excellent HDR quality but don’t want to pay out too much. The Sony Bravia may not have the same slim design as others in our list, but for picture quality customers found this TV to be worth the money and a great screen for playing all types of games. Brightness is easy to adjust to get the colour and contrast just right for both gaming and movies and sound is also said to be pretty impressive for the price of this TV. It’s also not too big, so you can expect this to fit in nicely to your bedroom or man cave without being too overbearing. You'll want to place your TV in the perfect position for the ultimate gaming sesh, so make sure you check out our top picks of the best TV stands to complete your set up. If you simply want a good quality TV all the family can enjoy, we've also found the best smart TVs on the market today.